To continue with my series on birds and their diets, this month I am posting a photo of the American Crow who visited me at my campsite last fall. We had a very harsh summer/fall last season and I guess this guy just needed to cool off. 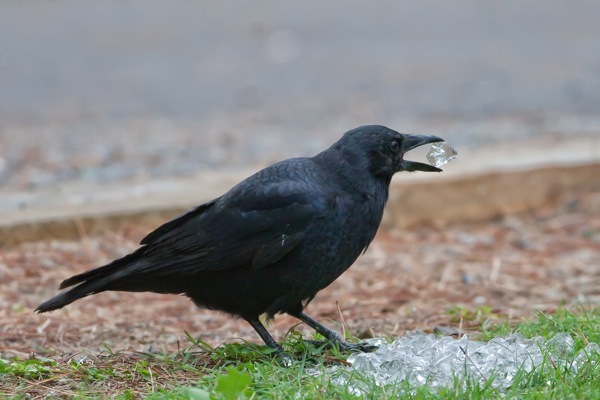 The American Crow is omnivorous. It feeds on a variety of things, including seeds, human food scraps, eggs, nestlings and different types of grains, with corn and wheat being their favorite. They also prey on smaller animals, such as mice and frogs and sometimes you will see them visit a bird feeder. Later in the cooler months, they tend to favor a variety of nuts. 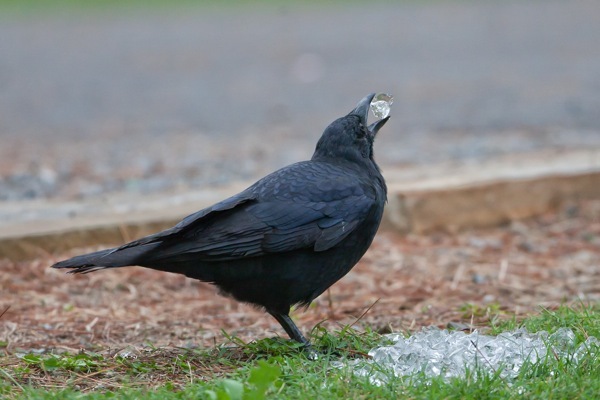 Some Crows have been observed using tools to gather their food. Well did you know that portray the time and situation. Nice shots. That Crow is living large with all of those diamonds. Viewing the ice handling crow is certainly helping me cool off in this rare 80 degree weather we are experiencing here in Chicago. Great photos! Terrific post, as always!